Julie Piekarski is on a mission. The former “Mouseketeer” and “Facts of Life” alum is on a quest to join the cast of the ABC hit show, “Dancing with the Stars”. 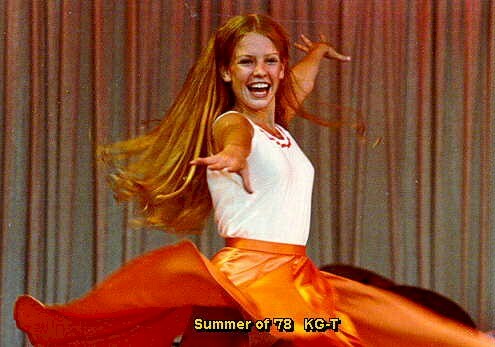 Julie is no stranger to the art of the dance, having honed her chops from a very young age performing in front of huge audiences at The Muny, the nation’s largest outdoor theater located in St. Louis, Missouri. I had the opportunity to speak with this amazing woman as she prepares to become the first Mouseketeer to do the Fox Trot in prime time. 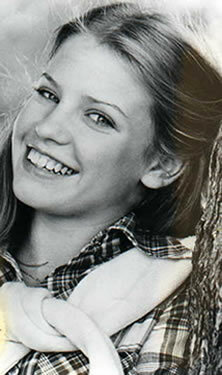 In this interview, Julie discusses her career, including her time on “The Mickey Mouse Club” and “The Facts of Life”. She also talks about a certain celebrity she rebuffed for a date and why she believes now is the perfect opportunity to once again showcase her dancing talent. goJimmygo (gJg): Tell me a little about yourself and how you got started in acting? Julie Piekarski (JP): Growing up, my mom enrolled me in dance classes. When I was five, one of the ladies there thought I had potential, took me under her wing, and became my mentor. She saw that I was a quick learner and had that “X factor” gift that can’t be taught. I started participating in community theater and shows as well as professional venues like The Muny Opera. gJg: How did you get involved with The Mickey Mouse Club? Disney was doing a nationwide talent search for their new TV show and several of my relatives, friends, and teachers were asking me to try out. After sending in a resume and photo for the preliminary casting, I received an invite to come for an audition. I traveled to Chicago for a two-day audition. At the time, I remember thinking that I’d be really lucky if I could just be made an “Honorary” Mouseketeer and appear on the show just one time. Instead, after the auditions were complete, I got a call to go to a local TV station for an on-camera interview and eventually was chosen for the show! Out of the 15,000 kids auditioned, only 12 were picked. gJg: What was that experience like? JP: It was amazing! Such an awesome experience to be that age and to work with Disney. Imagine growing up and hearing about Disney and seeing all of the animated movies and now I was actually getting to be a part of that. It was such a “family” working there. We went to school for 3 hours a day and then either filmed a segment, skit, or musical number, or were in rehearsals. The show was on every day. That meant that the turnaround time for new material was fast and a lot was expected of us. But we loved it. It never felt like work for me. In the summer and for our Friday segments, we would get to film in Disneyland. I will never forget that. We were in the park before it opened sometimes remained even after it was closed. Only a handful of people would be in the park. It was magical. 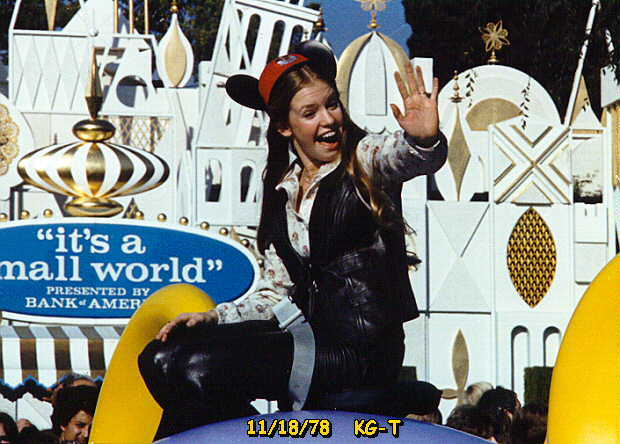 Though the taping of the show was fun, I loved performing live at Disney land and Disney World. We did 3 shows a day and 2 parades for five days a week for 13 weeks. On our lunch breaks, we were allowed to come in the back way and ride the rides for free. But it was hard on me when it came to my family. My mom stayed with me since I was only 13 and my dad and grandma stayed back with my sister in St. Louis to allow her to continue her life uninterrupted. So I’d usually work for three months and then come home for two weeks. That’s when I would go back to my school and take tests or exams (this was before email remembers), make up for lost time with friends, and catch up on family time with my sister and Dad. gJg: That’s where you met Lisa Whelchel (Facts of Life) for the first time! JP: Yes, Lisa was there too. There were eight people from the LA area and four of us from out-of-town. Lisa was from Texas and I was from St. Louis. We both bonded quite a bit during our time together. Since we were the out-of-state “Mice”, we tried to get lodging near each other and do things together on the weekends or after work. The show was really doing great. They were talking about making dolls of each of us, touring across the U.S., and cutting a record (yes I said a record). I remember plans were being made to come to everyone’s home over the summer break and film special segments about each of us and what our home life was like and our other passions, but all of sudden we received word that the show was cancelled. JP: “The Black Hole” movie came out. It was the first big, one of kind Sci fi movie that Disney had poured everything they had into. They made a choice and obviously chose wrong since the movie didn’t do very well. We still continued performing and doing appearances at Disneyland and Disney World as well as the TV movie for another year or so but the show part of it was over. By this point I had acquired an agent and started doing more television work: The big Dr. Pepper campaign “I’m a Pepper” commercials, Taco Bell Girl, made guest appearances on “Three’s Company”, Quincy, General Hospital and others. That was when “The Facts of Life” came along. gJg: Coincidentally, that’s also where you were reunited with Lisa again! gJg: What was your experience like on that show? JP: I enjoyed it. The seven of us girls got along great. Actually, Kim Fields and I became very close and still keep in touch. I looked forward to going in every day. I also enjoyed doing the photo shoots and publicity events. I was thrilled to be chosen to be on Hollywood Squares with Charlotte Rae. But most of all, the charity events really touched me and I was honored to participate and help out in any way. As for our show, we’d usually rehearse on a Monday, then there would be re-writes over the next few days and finally, we’d do a taping in front of a live audience. Now that was the best part. It was like doing real theater again for me. It’s such a high to hear the immediate response of the audience. It was a great process. gJg: Why do you think they down-sized the show and decided to only go with four girls? JP: I heard that the reason was they didn’t feel audiences could relate to all of the different characters. They couldn’t find enough specific “niches” for each girl to conform to and identify with. Maybe the writers were not able to write in that many characters for only a half hour sitcom? Even Julie Anne Haddock’s character (Cindi), who was sort of a tom-boy, wasn’t quite as “tough” as they wanted. That’s when they decided to bring in Nancy McKeon as Jo. gJg: Do you still keep in touch with people from the show? JP: Lisa and I have kept in touch a little. When she comes to town with her Christian Women’s Group, we try to get together. I’ve been involved with a great bible study, CBS, for the past ten years and that’s how I found out that Lisa was coming to St. Louis. Kim Fields and I talk more often. gJg: From there you went on to a show called “The Best of Times” which not a lot of people know also starred Nicolas Cage and Crispin Glover (Back To The Future). gJg: Why did you decide to take a break from acting? JP: Education was always important to me. It’s something that no one can ever take away from you. While in LA and still pursuing my acting career, I was going to school at UCLA and originally considered getting a degree in biochemistry because I was into genetics and cloning. But the workload became intense and something had to give. Instead, I decided to go into business and communications. That’s also around the same time when a boy from St. Louis came out to visit. He was going to dental school and had a promising dental practice waiting for him back home. When I went home for the summer, we started dating and ten months later we got engaged. I knew I wanted to raise a family away from the craziness of Hollywood and unfortunately around that same time my father passed away. A lot of things pointed me to being home. So I moved back. And then once I started having children I knew I had made the right decision. But I still do industrial films, spokesperson projects, and training videos here in St. Louis. I also am involved with three worthwhile charities that keep me busy beside all my volunteer activities for my children’s schools and extracurricular activities. gJg: Tell me about your kids! 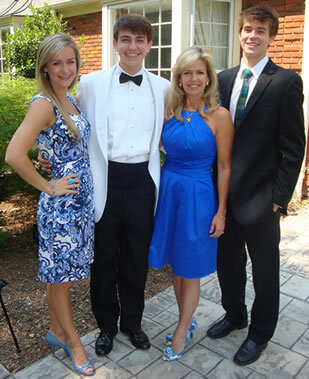 Patrick, my oldest, graduated from SMU with a double major in Biology and Economics and a minor in Spanish and Chemistry is now in his first year of medical school. He wants to be some type of surgeon. He’s an avid sports fan and a really strong soccer player. And he also has a creative side. …. He has a beautiful voice and performed professionally at The Muny, The St. Louis Rep, and Stages St. Louis while growing up. He was President of Southern Gentlemen; an A Capella group at SMU where he arranged the music and helped produced their CD as well as sing solo on it. 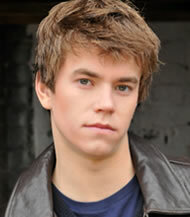 He’s also starred in two films: Logan and Moon Ring. My daughter Jacqueline is now in her junior year at Alabama…Roll Tide! She received a full scholarship and is part of the prestigious Fellows program as well as in the Honors College. She was actually recruited to be a gymnast for Bama. She was an amazing gymnast and it truly is her first love. She qualified at an early age to go to a special program with Bela Karolyi and was well on track to accomplish great things. It is a grueling sport and does take a huge toll on one’s body. Unfortunately, after two months at Bama her old back injury returned and she had no choice but to retire. Luckily for her, she is extremely gifted in dance and singing as well. She too has performed professionally at The Muny, Stages St. Louis, and The Cincinnati Rep. She is now dance captain of her college show choir and choreographs for Phi Mu, her sorority as well. She is also teaching gymnastics and ballet while focusing on getting her degree in order to become a physical therapist. Check out YouTube under her name to see her gymnastics demo and some of her performances. My youngest, Christian, really wants to pursue entertainment. He truly has that special something that you can’t help but notice. He has this amazing smile that just lights up a room. I am proud to say that he is a freshman at Yale and plans to double major in theater and economics. Though he’s a state champion racquetball player, I am trying to convince him to take up squash for Yale. He has been blessed with major roles in professional theater since the age of seven. He’s been very close to landing a Broadway role several times in shows like Mame, Tarzan, Billy Elliot and most recently Newsies where he was kept as part of the final 20 and sang in front of Alan Menken. They said he was just too young. He just got the lead in the musical at Yale as a freshman and is part of the infamous a Capella group The Dukes Men. He studies ballet, tap, jazz, hip hop, and lyrical. Tap is his favorite. 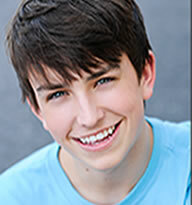 YouTube his name and “I love a piano” and Once in Love with Amy” to see him. When my children started showing talent and a desire to perform, I consciously chose to cut way back on what I did. I really wanted them to earn anything they would get because they deserved it and not because I was their Mom. gJg: What’s your plan now? JP: Now that my kids are all grown and on their own, I’m opening up the door again and getting back into the business. Last year, I portrayed Elle’s mom in “Legally Blonde” at The Muny and I recently performed the role of Lilly St. Regis in a professional production of “Annie”. gJg: You would be terrific on that show! JP: I really think I could do it. I’d like to get a following going to show the producers I’m serious about it. And besides, they’ve never had a “Mouseketeer” on there! It’s been a while since I focused on myself. I’ve spent these last years putting my energy into being a mother and wife. My children are now situated, happy and confident. I couldn’t ask for more. Now it’s my turn! [laughs] I really miss the dancing and the singing and I think “Dancing with the Stars” would be a great opportunity for me. I would thoroughly enjoy it: high kicks, splits and all! gJg: What’s it like when you go back to Disney now? JP: It’s surreal. It honestly seems like yesterday. There are times when I go there that, in my head; I think that I’m 18 again. Then I suddenly realize that I’m actually there with my own children! [laughs] It’s still such a rush to think I am a part of Disney history. gJg: Do you find that people still recognize you? JP: Yes people do and a lot of times it’s because of my voice. It’s funny, here in St Louis where there are so many private high schools, the big question isn’t so much: “Do I Know You?” but rather: “Did I go to high school with you?” So, when I see that look on their face that they know me but not sure why, I’ll usually wait until it really starts bugging them and then give them a hint. I’ll say something like: “Well, it may be because of a TV show…” and then they’ll realize who I am. They usually say something like I knew it but yet couldn’t imagine why you would be here in St. Louis. Then it’s nice to hear that they think I still look the same and haven’t changed at all. gJg: Tell me something not too many people know about you from those days. JP: Here’s something that always cracks up my fellow women friends: When Tom Cruise was first getting started; I had met him on several audition calls. It was on one of these occasions where he actually asked me out on a date. You know, this was before Tom Cruise became “Tom Cruise” and I remember… I turned him down! gJg: Do you have any regrets? JP: Honestly I don’t. Life happens for a reason and it takes you down a certain path. The only “regret” I think about as I get older is the amount of money that’s being made out there in Hollywood that people could use for good things rather than squandering it on things like drugs and alcohol. There’s money that can be used for education or to build a foundation or for charity. I always tell my kids: “Leave this world a better place then you found it.” And most of all, What you are is God’s gift to you, what you make of yourself is your gift to God. Click Here to Tweet your thoughts to Dancing With The Stars! Help Get Julie Piekarski on the show! Julie is a fabulous mom and a wonderful talent! We would love to see her on Dancing with the Stars. Our family and friends would surely tune in for every show. I agree Katherine. Julie is awesome. I would love to see her on that show. I remeber her! She was a doll. She would be great on DWTS! It would be a great blast from the past to have Julie on DWTS! 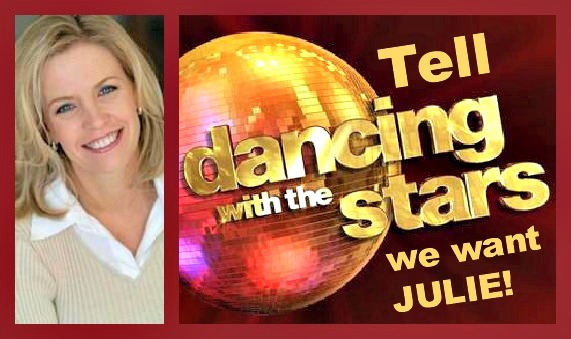 I would love to see Julie on DWTS! There would be a huge crowd from St. Louis tuning in and cheering her on! This is a very talented family and Julie leads the way!! I would love watching her on Dancing With the Stars next season. She would be amazing! What a great family – she would have a huge following as we all love her! Julie is larger than life and would be perfect for DWTS!!! Please put her on your show and see what happens!! 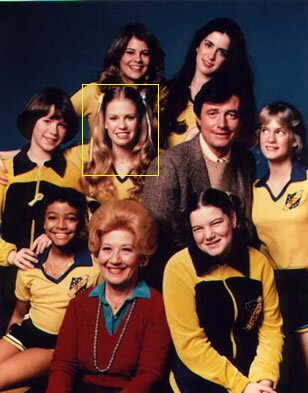 I remember watching Julie on Facts of Life. Would love to see her again on DWTS. It would be big sensation for everyone in St. Louis to have her on the show. We are rooting for her already.